This is my kitchen wall and my next room to redecorate. I am in the process of looking for new wall paper. I know what I want, if I can just find it. 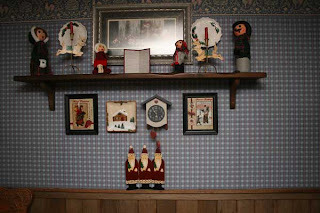 I purchased the carolers at a local art and craft show many years ago. They are made out of glass 2 liter pop bottles. I just love them. Please ignore my picture that is not centered. The picture is fairly new and we need another bracket put up. Jon just hasn't had time to do it and I since I am not mechanical minded, I am still waiting on him. If he doesn't get it done soon, I am going to tackle it myself because it drives me nuts.